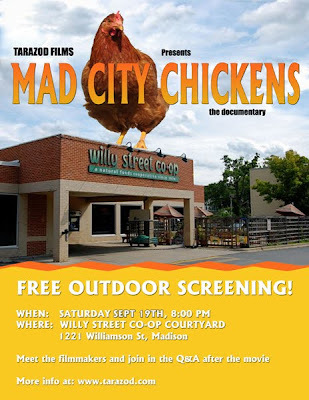 Tarazod Films & Media LLC: Mad City Chickens Outdoor Screening in Madison this Saturday! Mad City Chickens Outdoor Screening in Madison this Saturday! September 19th, 8:00pm-ish, Madison, Wisconsin - Outdoor Film Series presented by Willy Street Co-op and Four Star Video. Bring a chair. Starts at dusk in the front courtyard at Willy Street Co-op, 1221 Williamson St. (during the Willy Street Fair). Filmmakers are scheduled to attend.